$4,999.00 This may be in stock for quick delivery; please call! Perhaps no other guitar is as closely associated with Metallica's massively influential lead guitarist Kirk Hammett than the ESP KH-2 Vintage. A special adaptation of Kirk's standard ESP KH-2 model, the KH-2 Vintage is based on one of Kirk's personal guitars that saw duty in the studio and on stages around the world during Metallica albums and tours. The resulting "lived in" vibe, including distressed paint with small chips and pitting, lightning-fast neck, and famous "CAUTION HOT" sticker and "KIRK'S GUITAR" label, are perfectly recreated by the luthiers at the world-class luthiers at the ESP Custom Shop in Japan. But the KH-2 Vintage is more than just its cool looks. 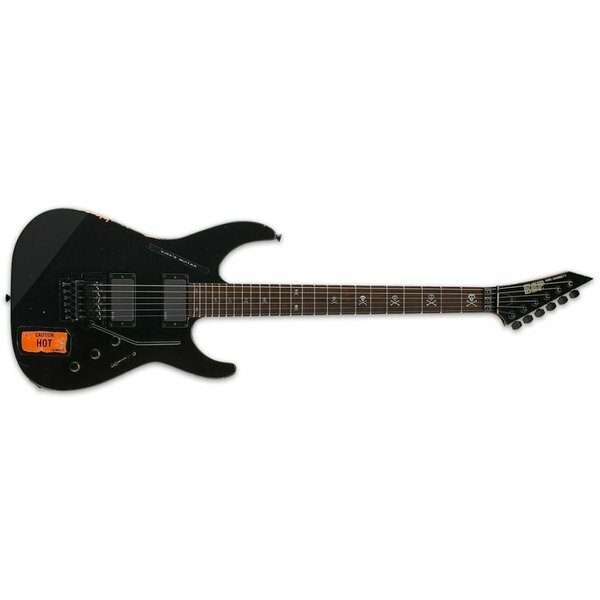 It's a neck-thru-body shred machine, with a comfortable alder body, extra-thin U-shaped maple neck, rosewood fingerboard with 24 extra-jumbo frets and Kirk's skull & bones inlays, and high-end components including Gotoh tuners, a Floyd Rose Original bridge, and a set of EMG 60A (neck) and EMG 81 (bridge) active pickups, just as Kirk's own guitar uses. Available in Black finish, the KH-2 Vintage comes with a premium hard shell case and a Certificate of Authenticity from ESP.